Tryptases comprise a family of trypsin-like serine proteases (peptidase family S1) that are stored in mast cell secretory granules and basophils. Tryptases comprise a family of trypsin-like serine proteases (peptidase family S1). Tryptases are stored in mast cell secretory granules and basophils. Mast cells are connective tissue cells derived from blood-forming tissues that line arterial walls and secrete substances, which mediate inflammatory and immune responses. Tryptases are released into the extracellular environment and are resistant to all known endogenous proteinase inhibitors. 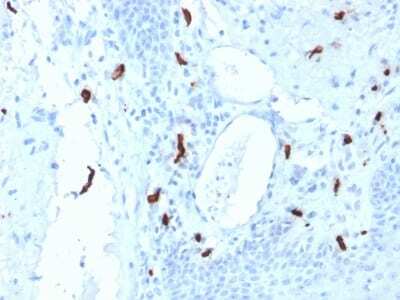 This antibody reacts with mast cells distributed in skin, synovium, lung, and heart. 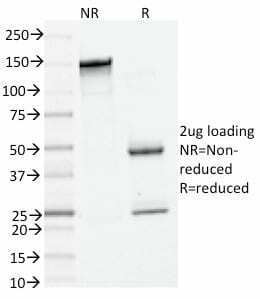 This antibody does not bind with any other cell type. Human mast cell tryptase is considered to be an important marker of mast cell activation and is an important mediator of inflammation. Mastocytosis is a term collectively used for a group of disorders in which there is abnormal accumulation of mast cells in one or multiple organs. Anti-tryptase, combined with anti-CD2, anti-CD25, and anti-CD117, can be useful in identifying reactive mast cell hyperplasia, myelogenous neoplasms, mast cell leukemia, and mastocytosis. Catalog number key for antibody number 1961, Anti-Tryptase (TPSAB1/1961) The prefix indicates conjugation, followed by the antibody number and size suffix. Gurish, M.F. and Austen, K.F. 2001. The diverse roles of mast cells. J. Exp. Med. 194: F1-F5.